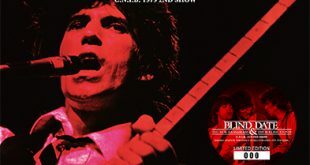 The Rolling Stones’ final night in the LA Forum in 1975 is one of the classic bootleg recordings with more pressings on vinyl and CD than any other. 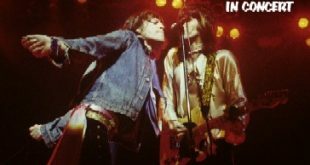 It’s natural then that the Stones, who are now currently releasing their archives online, would include the July 13th performance. Since they’re only issuing it as a download, L.A. Friday fills a considerable need for those collectors who like to have actual artifacts in their collection. Every release of this show in the past relied upon audience recordings including, for the last twenty years, the popular Mike Millard tape including discs five and six of The Lost Millard Masters (Vinyl Gang VGP-340) and Rockin’ At The Forum 1975 Last Night (SODD 036/037). 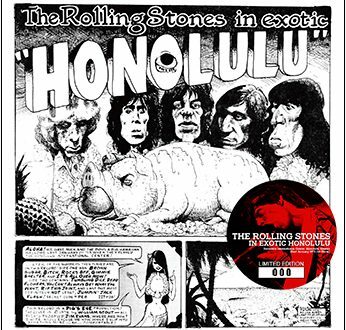 The professional recording from the Rolling Stones Archive website is outstanding. The instruments are rich, deep, clear, and extremely heavy. The guitars and bass have a prominent place in the mix, but the keyboards and pianos also can be well heard. It offers a different perspective than the Millard tape. The amateur recording is very good at picking up the atmosphere of the show and presents the Stones as a spectacle. This tape brings the musicianship of the band into greater focus, and their enthusiasm in playing in Los Angeles is most apparent. For the female vocalization in “Gimme Shelter,” the annoying horns from 1973 were replaced with synthesizer and sounds much better. “You Can’t Always Get What You Want” is the band’s attempt to get a sing-along anthem going with the audience, a rare phenomena for them. Mick Taylor’s intense solo is replaced by Wood’s tasteful work. Steve Lawrence plays a subdued solo on the tenor saxophone. Afterwards there is a long delay because of Wood’s malfunctioning, out-of-tune guitar and Jagger introduces the band earlier than he normally would. When things are cleared up they play an interlude with two songs from each of the last two albums Goats Head Soup and It’s Only Rock And Roll, the two released since their last visit to the US in 1972. “Doo Doo Doo Doo Doo (Heartbreaker)” is the one radical in the set list, most of the time appearing but other times not. This arrangement has the clavinet replacing the horn section and includes a subdued funk workout in the middle. “Fingerprint File” sounds like controlled chaos and very raucous, a great contrast with “Angie,” where Billy Preston adds a gorgeous church organ vibe. 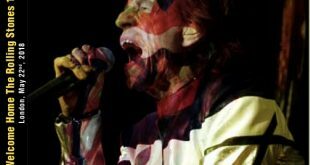 “Wild Horses” is another slow and sad song and Jagger sings in an exaggerated country and western twang in his voice (much like “Far Away Eyes” from Some Girls). Preston is introduced by Jagger for his two song set. After telling everyone he’s from Los Angeles he plays the new song “That’s Life” and “Outta Space.” The latter features a lot of fun, dancing, and Jagger swinging on a vine trying to get to outer space. After “Brown Sugar” they follow with the epic “Midnight Rambler.” In addition to the guitars, there are also keyboards thrown into the mix. Charlie Watts also gets into the act, playing the same percussion as in “Fingerprint File.” What it lacks in intensity is made up in creativity. At the show’s end, both “Street Fighting Man” and “Jumping Jack Flash” race by in a blur. The audience can be heard at the end of the latter, cheering the confetti falling from the ceiling. 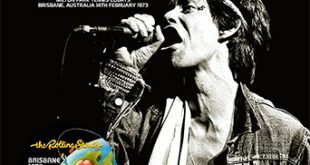 The final song of the night is “Sympathy For The Devil.” Joined by the Steel Band Association of America, this was a special final number played only in New York and Los Angeles. This is the last time it was played in 1975 and would appear in four of the six Earl’s Court concerts in May 1976. 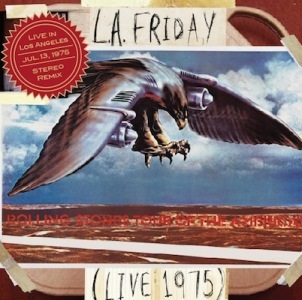 L.A. Friday (Live 1975) is packaged in a double slimline jewel case. The interests are only printed on one side and utilize the photos from the RSA website for the artwork. In addition to the live shots, there is a photo of the tape cases used including a box labeled July 12th. (Wouldn’t it be great to hear that show from a professionally mixed multi-track source? We currently only have a mediocre audience recording. And it is perhaps the best of the LA shows.) Ultimately, this is an important, essential release for the collection worth having for the excellent sound quality and for the epic performance. Good review. I picked this up at “special” price and am very happy to have pressed CDs of this show. Too bad the official site continues to leave me without a viable alternative to download. Funny how torrents haven’t yet put real bootleggers out of business.